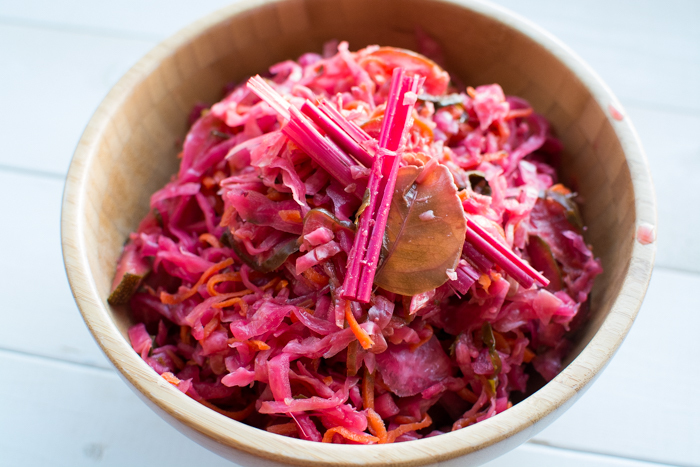 To my fermenting friends, I am sorry it has been so long since a proper sauerkraut or fermentation post of any kind. 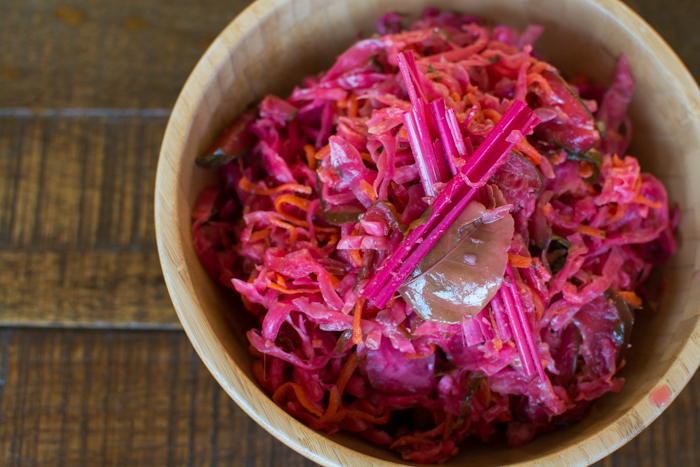 Please follow me on Instagram for timely updates in that arena and to see how I incorporate ferments into my daily eats. I have enough pictures and ideas that I could start Fermentation Friday’s. Let’s start with today and see what happens. 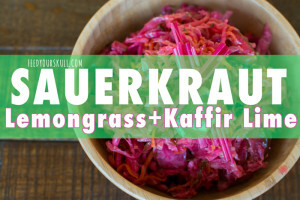 Today’s ferment share is for Lemongrass + Kaffir Lime Sauerkraut. The flavor is pretty insane and mind-blowing. It has just the right sour, a pleasant savoriness, and some super wild flavors thanks to lemongrass, kaffir lime leaves, and white miso. With this batch I wanted to make something different. As I was thinking about vegetables, seasonings, and favorite foods it hit me. I had some dried lemongrass and kaffir lime leaves in the cabinet. Why couldn’t I use those? My first introduction to those not-so-common ingredients came about when we lived in Batavia. I was at my favorite restaurant, Tusk, for lunch with a friend and asked Pam about kaffir lime leaves and where I could get them. 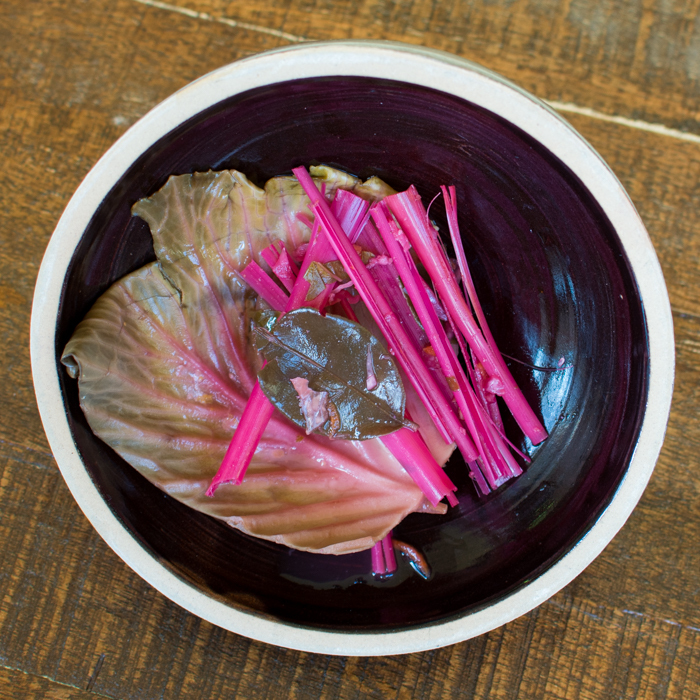 I knew these elusive leaves were in several of their dishes and I was interested in cooking with them. 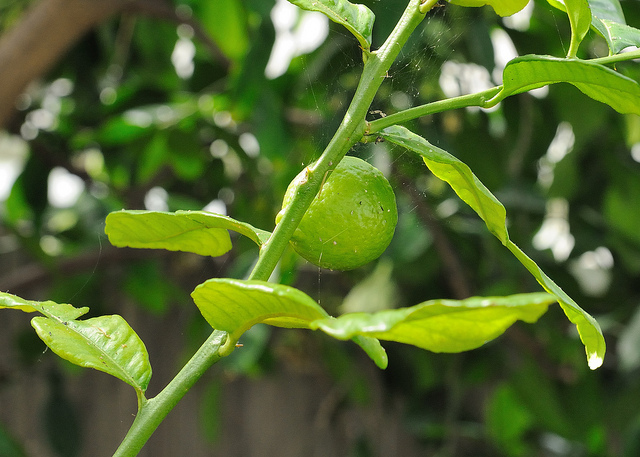 We talked about them for several minutes and she explained how they grew and what they felt like and then proceeded to go back in the kitchen and bring out a small shopping bag filled with several kaffir lime leaves and even a lemongrass stalk for me to experiment with. It’s been several years since then and you can know find dried kaffir lime leaves and lemongrass from Thai Kitchen. You might be familiar with their coconut milk or noodle-based meals. Local peeps, The Moscow Food Co-op carries both the lemongrass and kaffir lime leaves. Our small Indian convenience store in downtown Pullman even carries fresh kaffir lime leaves (or at least the time I stopped in). 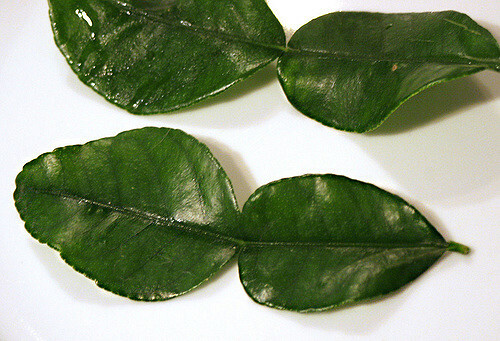 Kaffir lime leaves add a tart citrus note and authentic Thai-inspired flavor. 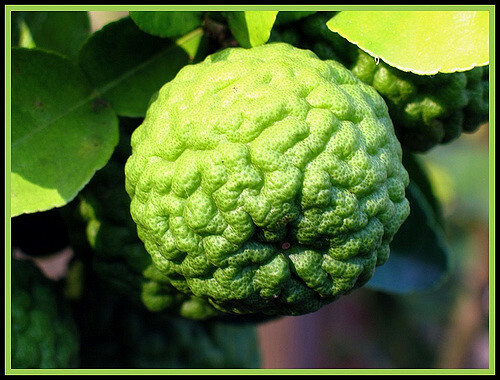 I’m sure you could substitute lime juice with a little lime zest for a similar flavor. And so we begin. This batch fills a 5 liter Harsch or TSM fermenting crock. 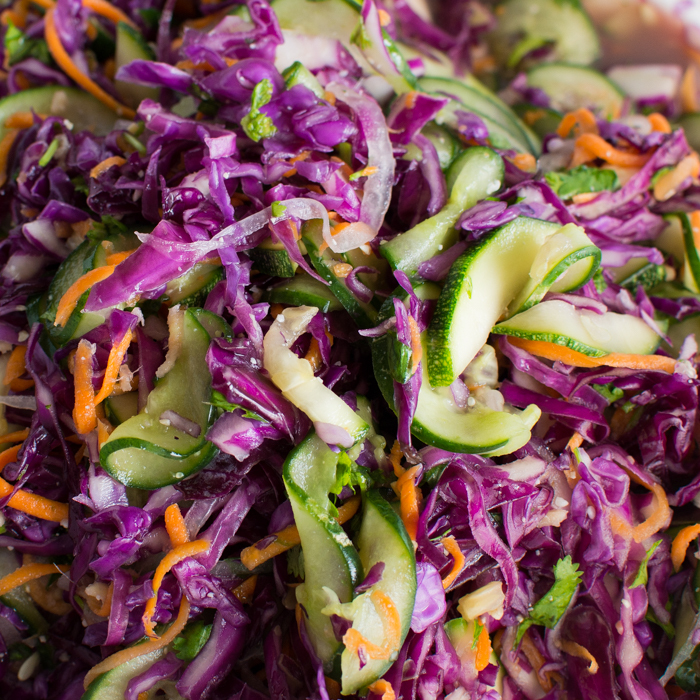 As with any ferment how you prepare the vegetables doesn’t really matter. Shred. Chop. Grate. Julienne. It’s a matter of preference. This time around was a combination of shredding, slicing, and chopping. 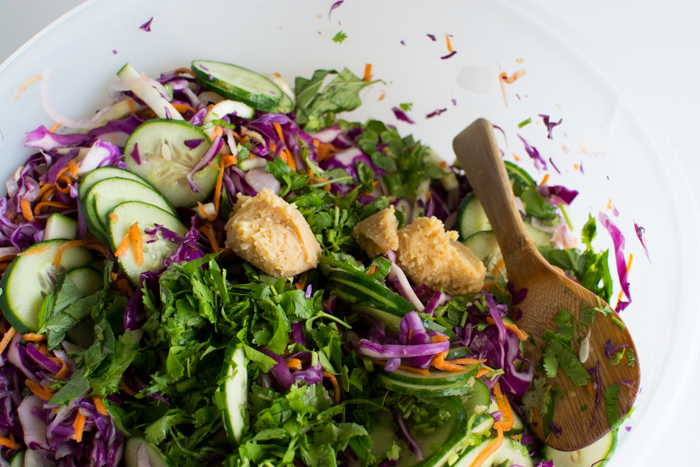 My food processor’s slicing and shredding discs turn a beastly chore into really easy work. Just quarter most of the ingredients so they fit in the chute area. 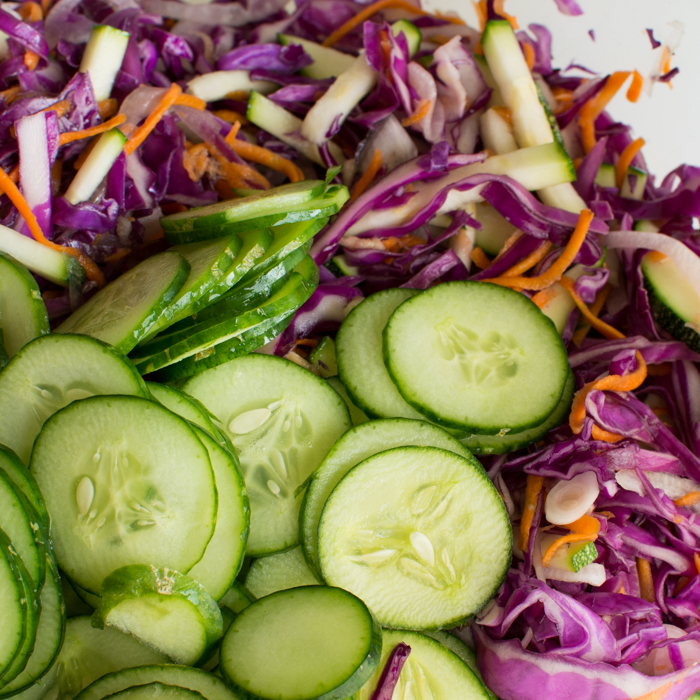 You can even use the slicing disc to handle cucumbers and zucchini. 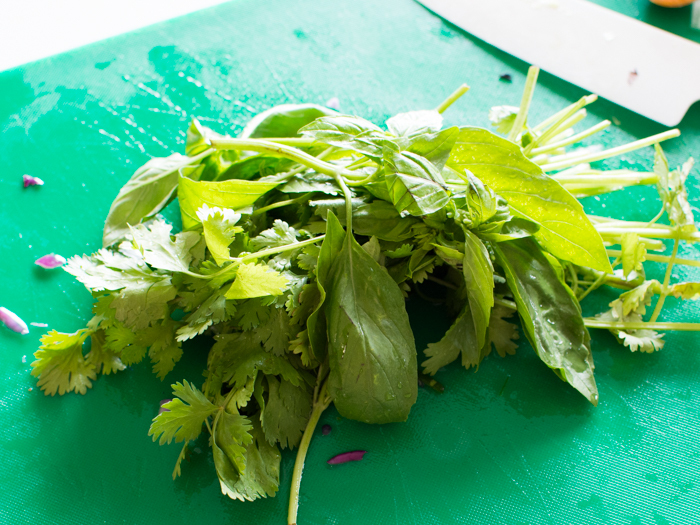 Along with kaffir lime leaves and lemongrass I used a good handful of cilantro and fresh basil. 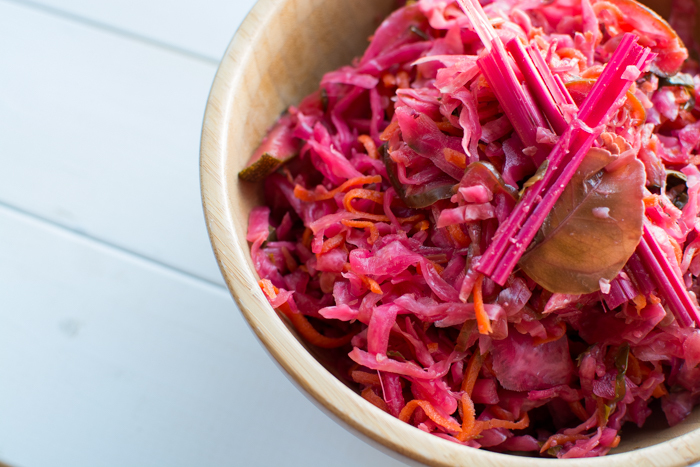 This batch of sauerkraut has a satisfying-hunger-inducing aroma and a great crunch. It made me want a heaping plate of Tusk’s summer rolls + dipping sauce. I incorporated a few dollops of white miso. Really just because, but also for that wonderful umami flavor. It might even boost fermentation as it is a fermented product. For a thorough HOW TO, check out this post. In a huge bowl or vat start massaging your cabbage with half the salt. 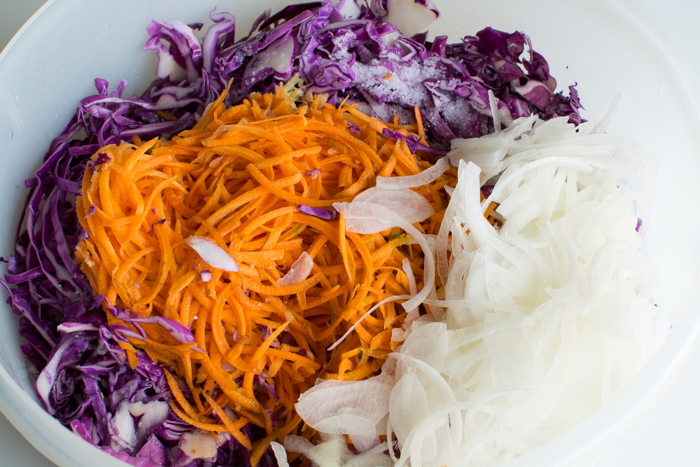 When the cabbage starts to release water, add in the carrots, onion, and remaining salt-keep massaging. When a significant amount of brine appears, add in the remaining ingredients (except kaffir lime leaves and lemongrass) and massage just a little bit more. 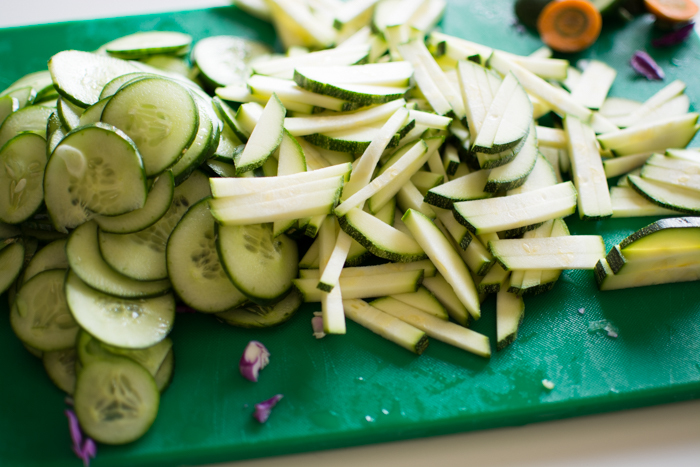 It's not necessary to pulverize the zucchini, cucumber, and herbs. Place half of the kaffir lime leaves and half of the lemongrass at the bottom of the crock. 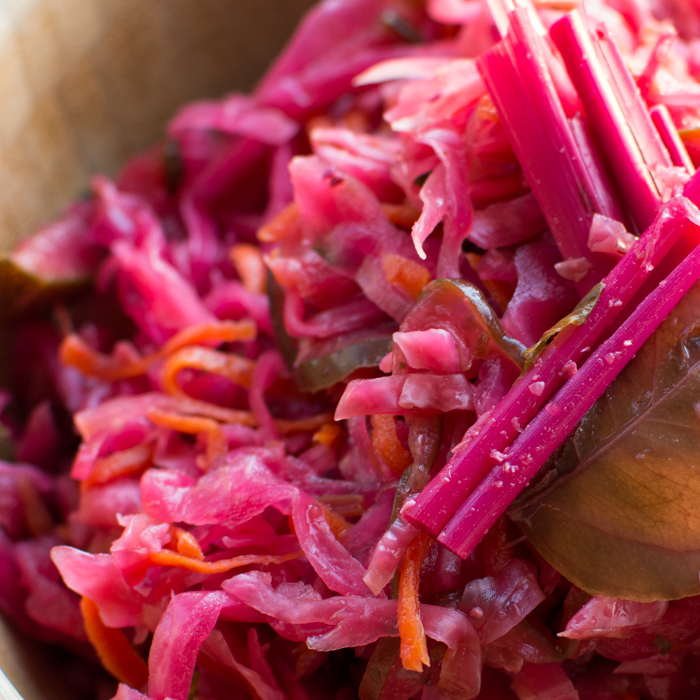 Fill with sauerkraut, really packing it in as you go. At the top put the remaining kaffir lime leaves and lemongrass. Place a layer of cabbage leaves. Put in the stones and press to make sure the brine covers the stones. Put your lid on, fill the gutter with water, and mark the open date on your calendar. I fermented this batch about 5 weeks. You could go anywhere between 3 and 6 weeks for a tasty result. When jarring the sauerkraut remove lemongrass and kaffir lime leaves as you come across them. It won’t hurt you to eat them, but it won’t be pleasant as they are tough and reedy. 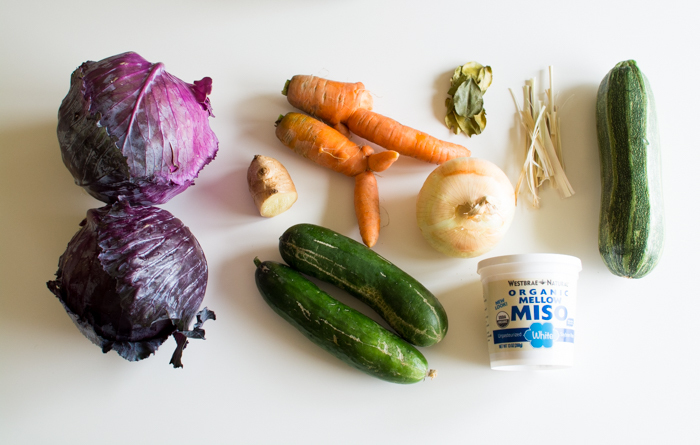 I know I stressed organic ingredients quite a bit in my flagship post, but don’t feel that small accoutrements like ginger, garlic, and herbs need to be. Use what you can find and try to have what weighs the most i.e. cabbage, cucumber, zucchini be organic. This and any sauerkraut will last for months in the fridge and even continue to slow roll ferment, though I’ve never noticed a drastic flavor difference. Consider I’m using up the last little bit of this batch which is around 6 months old. How old can sauerkraut stay without spoiling? I have some I made a year and a half ago. Is it still edible? It all depends 🙂 Trust your senses with this one. In theory, yes, a sauerkraut could be delicious after a year+ in the fridge. If it smells off or a little bite yields an unpleasant taste, it’s better to toss and move on. If not? Enjoy!